In the course of preparing our latest annual report, we learned some interesting things about how far Real Pickles products travel from farm to fermentation to fork! Since Real Pickles’ beginnings in 2001, one of our key social commitments has been to source our vegetables only from Northeast farms and to sell our products only within the Northeast. 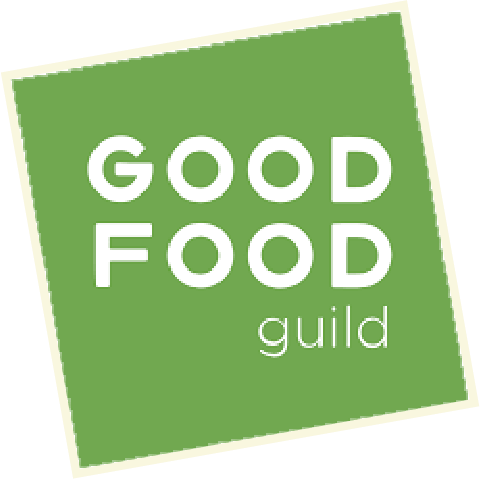 We do this because we want to promote the development of strong local and regional food systems. 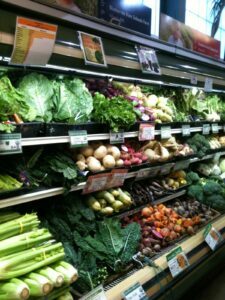 There are so many good reasons to be getting our food from closer to home – freshness and nutritional value, food security, strong agricultural economies, climate change, and more. And, as I’ve written about here, it’s not just local that’s important but regional, too. We’ve always had some sense about how far Real Pickles products travel from farm to fermentation to fork, but we’d never before really tried to figure it out. For our most recent annual report, we decided to go for it. We posed the question, “What can a business do to build a strong local & regional food system?” We offered up our answer: “source locally & regionally…sell locally & regionally!”. 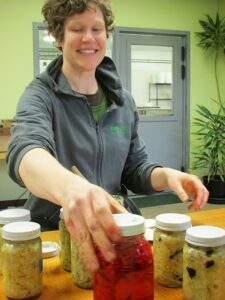 And, then we got to work with the calculator and spreadsheets to ascertain just how far – on average – our vegetables traveled from farm to fermentation last year, and how far our products then traveled from fermentation to fork. Upon delving into the project, it quickly became apparent that we weren’t going to come up with precise numbers. 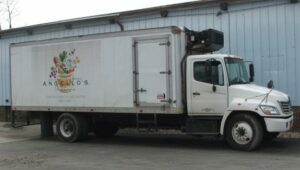 The reality of food transport involves all kinds of complexities that we could never fully sort through. But, we could arrive at some useful estimates that would illustrate the difference it makes when a business commits to sourcing and selling within a region. Determining the average distance that our vegetables traveled last year from farm to Real Pickles was the more straightforward of the two calculations. 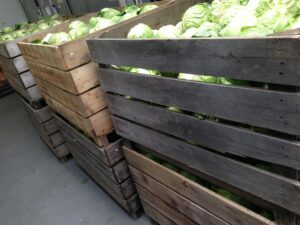 We received a total of 128 vegetable deliveries from ten farms – beginning with the first load of cucumbers from Atlas Farm in late June, ending with our last drop-off of storage beets from Red Fire Farm in February. For the purposes of the calculation, we assumed that all vegetables traveled straight from the farm to Real Pickles, with no other deliveries along the way. Organic. Local. Cabbage. Ready to ferment! The result? 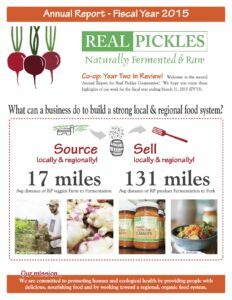 The 285,000 pounds of vegetables used to make Real Pickles products from the 2014 harvest traveled an average of 17 miles from farm to fermentation!! We’re very excited by this number. 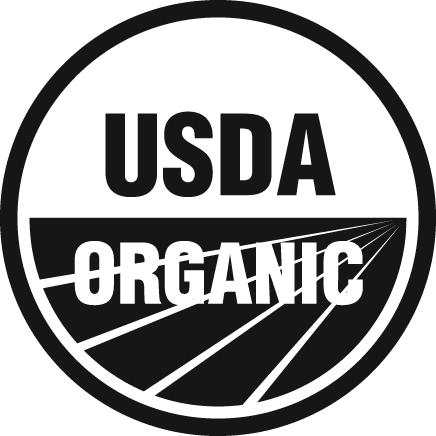 Of course, it’s also what we’d expect given our commitment to working with suppliers like Riverland Farm (13 miles away), Atlas Farm (7 miles away), and Old Friends Farm (22 miles away). 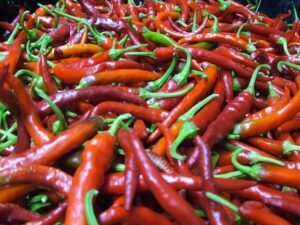 What if we made no commitment to sourcing from Northeast farms? Real Pickles would likely be buying vegetables from much farther away. 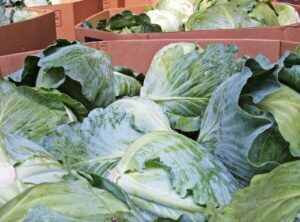 Most of our cabbage, for example, would be coming from major cabbage-producing areas like California, Texas, and Mexico. 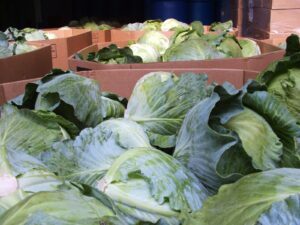 In that case, our cabbage would be traveling thousands of miles from farm to fermentation. 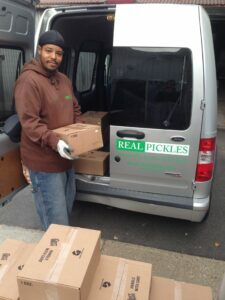 CJ loads the Real Pickles van for local deliveries! Figuring out the average distance from fermentation to fork was a more challenging task. 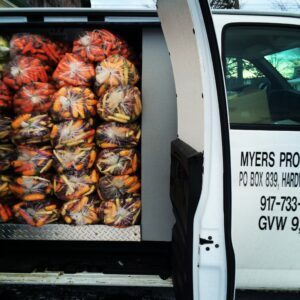 Nearly 20,000 cases of Real Pickles products traveled to over 400 stores last year. 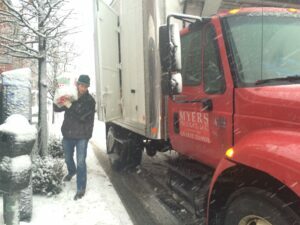 Retailers here in the Pioneer Valley – like River Valley Co-op and Foster’s Supermarket – receive their pickle orders via the Real Pickles delivery van. While those further afield – such as the Park Slope Food Coop and Martindale’s Natural Market – get their Real Pickles products through our distributors or via UPS. We couldn’t possibly know exactly what route each jar of kimchi or sauerkraut took to get to each store last year, nor can we know the route each jar traveled to get to our customers’ plates! We do, however, have good data on how many cases of Real Pickles product were sold to each store last year. So, we mapped the driving mileage from Real Pickles direct to each of our top 50 retailers – which together sold about half of our product last year. (We made the assumption that doing the calculation based on this group of stores would yield a reasonably accurate result, while saving quite a bit of time.) Then, we used our sales data to calculate an overall weighted average for distance traveled. Based on this approach, the final result was pushed higher by fast-selling stores in places like New York City (~175 miles away), while kept lower by nearby stores selling lots of our pickles in such towns as Northampton, MA, and Brattleboro, VT (~20 miles away). When all the math was done, we learned that Real Pickles products traveled an average of 131 miles last year from fermentation to fork! We’re pretty excited by this number, too. 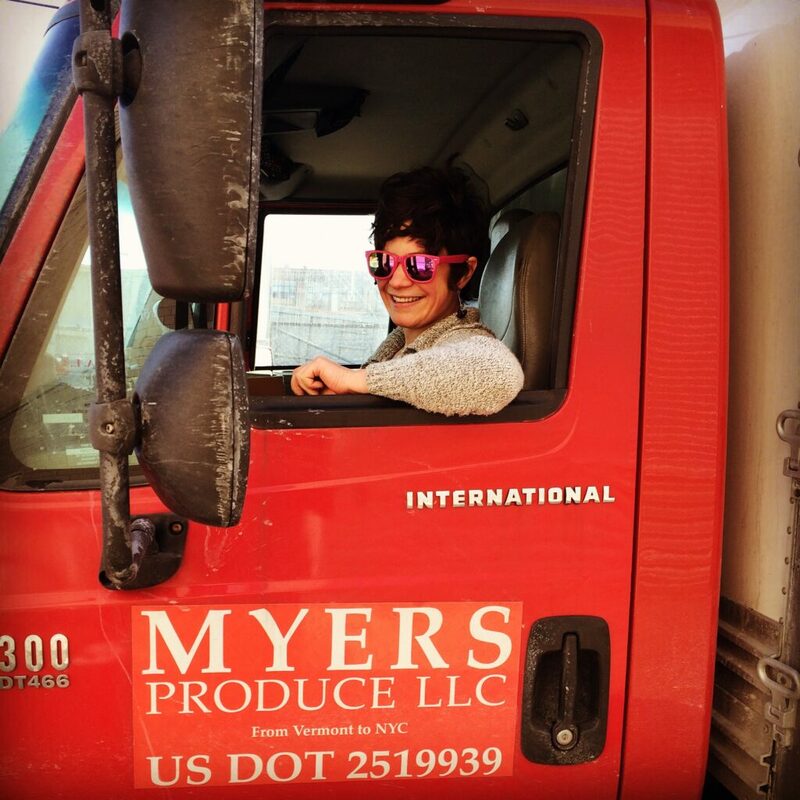 As a growing business producing an ever more popular food (fermented vegetables), we know we could easily be shipping our Real Pickles products thousands of miles all around the country. But, we also know there are so many important reasons to be sourcing and selling regionally. When we consider that our 20,000 cases last year traveled an average of 131 miles – rather than 1,000 or 2,000 miles – we know we’re making a difference. A Community Perspective: Keeping It Local! Margaret Christie is a rock star. Especially when it comes to our local food system here in western Massachusetts. As executive director of Community Involved in Sustaining Agriculture (CISA) in the late 1990s, she oversaw the launch of the hugely successful “Be a Local Hero, Buy Locally Grown” marketing campaign. 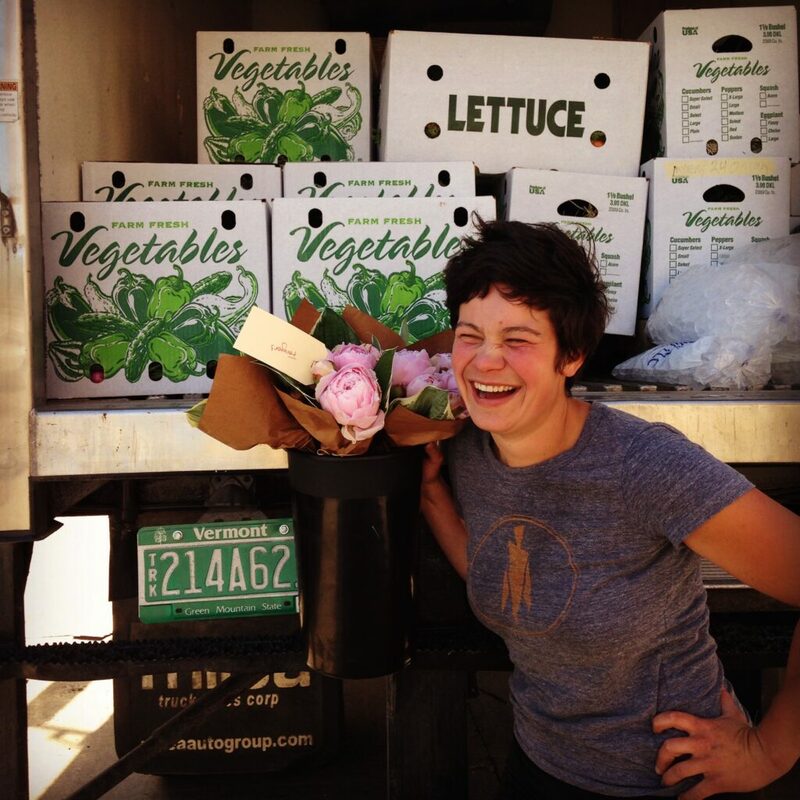 In her on-going work as CISA’s special projects director, Margaret plays an essential role as researcher, thinker, and organizer in the effort to build a better food system – locally and beyond. Here, Margaret offers her perspective on the social benefit of Real Pickles’ decision to go co-op. Thanks, Margaret, for your kind and insightful words! Why is Real Pickles’ decision to go worker co-op good for the rest of us? If they keep making good dill pickles, ginger carrots, and sauerkraut, do we care who owns them and how that ownership is structured? Yes, we do—not only because of the impact this business will have, but because the folks at Real Pickles are showing us how we can be involved in building a better food system. community benefits, but most important may be the model of business success they offer. As we work together to create a network of farm and food businesses that provide more of the food we eat every day here in the Pioneer Valley of western Massachusetts (and the surrounding region), we often focus on business start-ups, not on what follows success. But what happens to a business that starts with a commitment to sourcing regionally or sustainably grown ingredients as the business matures? When the owners are ready to do something else—or just to shoulder a little bit less of the burden of keeping the business going—how can their commitment to regional sourcing be maintained? Real Pickles’ decision to form a worker co-op models one answer to this important question. Every month, I attend meetings of the PVGrows Loan Fund as CISA’s representative. When local farm and food businesses apply to us for financing, we review a list of criteria that represent our mission of “enhancing the ecological and economic sustainability and vitality of the Pioneer Valley food system.” Among our concerns is long-term commitment to the Pioneer Valley. If we finance a new business, will they continue to source from local farmers in the long run, or will they decide that it’s less expensive to find their ingredients in the global marketplace? Or might they move altogether, finding both cheaper ingredients and cheaper labor? When evaluating loan applicants, we often have no way to assess the owners’ long-term commitment to our region. Real Pickles’ new ownership structure, in contrast, provides two clear answers to this question. First, the business will now have multiple owners, all relying on its success for their employment, and unlikely to choose to ship their jobs someplace else. Second, they’ve codified their commitment to regional sourcing and regional sales in their bylaws, and made those bylaws very difficult to change. Rather than getting big and getting bought out by a larger corporation with, perhaps, a stronger commitment to their shareholders’ profits than to our local economy, Real Pickles has strengthened their commitment to our region while restructuring their ownership. Real Pickles’ action reminds me of a courageous step taken by another Franklin County business more than a decade ago. In 1998, a group of Franklin County dairy farmers decided to form a co-op and market their own milk to local consumers, becoming Our Family Farms. They introduced the milk by giving out lots of free samples, explaining that it came from their own farms, right down the road. 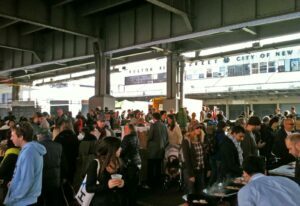 There wasn’t much fanfare then about locally grown food, but the response was clear: the milk was delicious, and local residents understood that supporting businesses in their own communities benefitted the local economy. 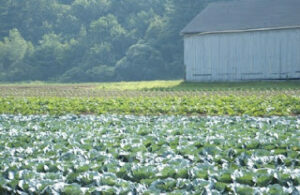 Many farmers and farm advocates in the region took notice. At CISA, when we started the Be a Local Hero, Buy Locally Grown campaign the following year, Our Family Farms’ success gave us confidence that the campaign would resonate here in the Pioneer Valley. CISA is now celebrating our 20th anniversary, and the founding of Our Family Farms was a critical milestone on the road to the Local Hero campaign and the explosion of interest in local food and farms. I expect that Real Pickles’ decision to form a worker co-op—and the campaign for investors which will finance the shift in ownership—will play a similarly important role in the growth of our local food system. Growth and success can lead to a renewed commitment to our region and the health of its farms, workers, and local economy. And as residents of this region, some of us can do more than applaud and eat pickles: we can finance this growth from within our own community.